For New York, it’s the Hamptons. 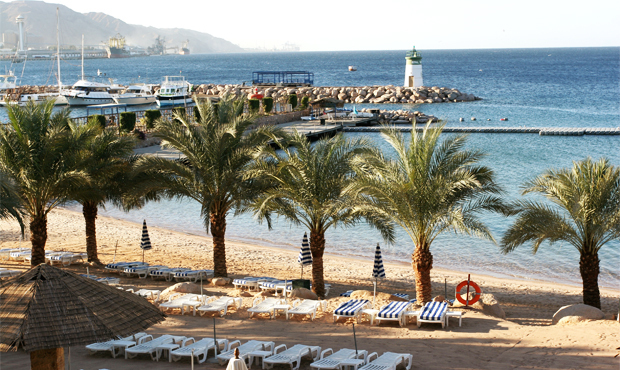 For Amman, Jordan, the beach people migrate to for the summer is the port of Aqaba. Without this warm-watered outlet, the Hashemite Kingdom would be landlocked. For years Aqaba has served as a low-key retreat known only by Ammani aristocrats, some of the working class, and handfuls of sunburned German tourists stopping by during their tour of Petra. Recently, however, a slough of new projects in construction promise to elevate the city’s status. Standing on the sand on one of Aqaba’s beaches and looking south, it becomes clear why this has been such a historically important city. The rolling red mountains stretch into Saudi Arabia on the left. The gulf curves into the Israeli city of Eilat on the right, and off towards the horizon one can make out the edge of Egypt. A tiny fishing village for most of the 20th century, Aqaba has enjoyed rapid expansion in recent years. Nestled in between the border, the beach, and the mountains is the city center where roads are lined with towering date trees and tropical flowers embroider the dusty pavement. Some neighborhoods are true to Aqaba’s modest origins, while in others lavish resorts emit ripples of so called modernity wherever they are dropped. Tourism photos are always framed in a manner that none of the local haphazard is visible, but really, the congested fish markets and the sandstone houses are what give Aqaba its character. Resting on the crossroads of civilizations, Aqaba is and has been a strategic ruby on the crown of the kingdom. The city was conquered by the Edomites, the Nabateans, the Romans, the Byzantine Empire, the Islamic Empire, the Christian Crusaders, the Mamluks, and the Ottomans, in that order. After World War I, the Hashemites pried it from the Ottomans in part of what is known as “The Great Arab Revolt”, which Lawrence of Arabia took part in. Ever since then, the Hashemites have had a warm relationship with their solitary beach. The royal family enjoys a scenic private lagoon at the western end of the beach. A massive flag of the Great Arab Revolt still flies today over the city as the second tallest freestanding flag pole in the world. Nearby, the ruins of Ayla, an old Islamic city built in 650 CE, crumble in the dry heat. Aqaba has caught mega project fever from its Gulf neighbors. Four notable projects promise to reimagine the city as a global tourism destination through a mixture of luxury hotels, man-made lagoons, and sleek new infrastructure. Saraya Aqaba, escape to Saraya, is the first of these projects. With Islamic arches that rise out of a scenic lagoon, Saraya is a Middle Eastern themed Disney Land for adults. Similar to Saraya is the Ayla Oasis, seaside living reinvented, that will add 17 kilometers of beach to the city. Although both of these projects are colossal by any standard, they are dwarfed by Marsa Zayed, the vibrant heart of Aqaba. Weighing in at approximately $10 billion, Marsa Zayed is the largest planned development in the region. Essentially, Al Maabar, an Abu-Dhabi real estate company, has decided to construct a new city on a large strip of the southern coast that will feature 30,000 residential units. Marsa Zayed isn’t the heart of Aqaba, it is an entirely new Aqaba. It has everything one would need in a city, including a hospital, schools, a mosque and financial district. Judging by the look of it, very few residents of old Aqaba will be able to afford housing there. If the city is hoping to run year-round, it will have to look past the wealthy Jordanians who flock to Aqaba exclusively during vacations and the summer, and into the Gulf and expatriate markets. It begs the question, how many Atlantises can be pulled out of the sea before one or even two remain empty? All that is missing from Aqaba now is a Star Trek theme park. Wait, what? They’re getting one of those too? Yes, although it sounds like something pulled from the headlines of The Onion, the Red Sea Astrarium will cost $1.5 billion and include themed rides and a five-star experience. According to RGH Themed Entertainment, the project will be “built upon the foundations of creativity, integrity and wisdom”. Well, it certainly is creative. For those wondering about the back-story, King Abdullah II is a long-time Trekkie, which in Jordan warrants the construction of an entire theme park. Aqaba has many of the things people look for on vacation: clear waters, yellow sandy beeches, coral reefs, scuba diving, cheap alcohol, (the Aqaba Special Economic Zone is low tax and duty-free), and swimmable weather most of the year. Petra is in Aqaba’s backyard along with the breathtaking Wadi Rum area, and Egypt is a boat ride away. However, there are some major obstacles to surmount before it becomes the Monaco of the Middle East. For one, the world is struggling to trudge out of a quicksand recession, and the super projects will ultimately require a long steady stream of capital to thrive. Another thing is the looming bully of global warming; the already sweltering city does not need a temperature boost. The Gulf of Aqaba acts as a breaker for the currents of the Red Sea, but only time will tell if this holds true for the city’s politics in the midst of a stormy region. If Aqaba is able to follow out its vision, Abu Dhabi might have just found its vacation venue.